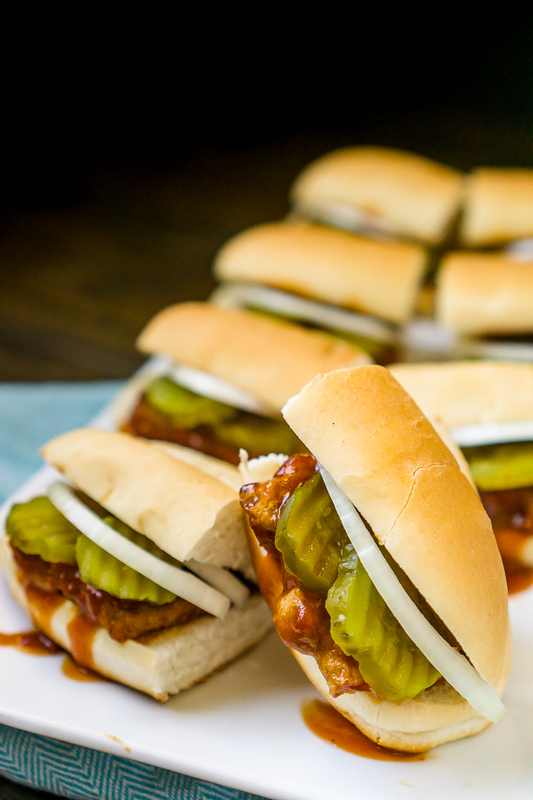 You can now enjoy a take on the McRib sandwich year round with this copycat recipe inspired by the rare seasonal sandwich! This copycat recipe is a quick, easy dinner idea that requires almost no prep work, making it the perfect time to get organized for 2018 or play a game with the kids! An Easy Dinner Recipe with Only 15 Minutes of Prep Work! Happy New Year!! Have you made your yearly goals and resolutions yet? I just shared my Word of the Year and a FREE worksheet with all of you last week and have been thinking about how it applies to every area of my life. I want to thrive this year, which means for our family growing our savings account and being able to settle into a house. It’s a BIG goal that requires a lot of work, including eating at home more often. One of our biggest spending areas is eating out or ordering in, so I am on a mission for 2018 to keep super easy and quick meals in the house that we can have when we’re feeling a bit lazy about cooking, which happens more than I’d like to admit. Criteria for these meals? 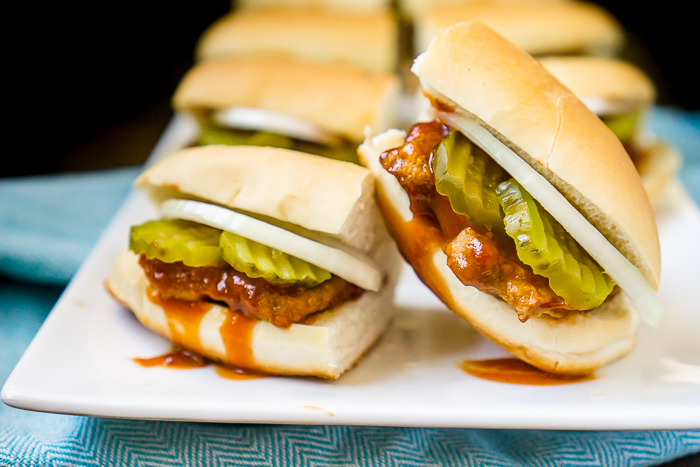 This Copycat McRib Sandwich recipe definitely fits the bill. My husband was so excited about enjoying these for dinner and having all the leftovers for lunch throughout the week. My Italian Night with an On-Cor Lasagna and a fresh Tossed Caprese Salad also meets all the criteria in case you missed it. On-Cor is a great solution for keeping us on track with eating at home as a family. They have been bringing families to the table with their entrees for 70 years! To make this copycat McRib sandwich, I picked up a a box of Barbecue Sauce and 6 Boneless Rib-Shaped Patties at my local Marianos. The hickory-smoked boneless rib patties, made with pork and chicken, are marinated and char-broiled for hickory smoked taste, then smothered in barbecue sauce. While the entrée was cooking in the oven, I was able to squeeze in a little extra family prep time while Bryan played with Liam after work. I got our family calendar updated in the kitchen, went through the mail, prepped Liam’s bottle and breakfast for the next day and even squeezed in a few stories as a family! Of course, if you are looking for even faster dinner cook time, you could use the microwave prep option and have dinner on the table in under 30 minutes. On-Cor entrées are fully-cooked, frozen dinners that are conveniently packaged. There is no prep work other than preheating the oven and peeling off a layer of plastic film. That’s it! And On-Cor has been working to enhance their products to satisfy us busy moms, giving us quality dinner solutions and new packaging that makes it easy to understand exactly what we are feeding our families. So not only does On-Cor want to help you out with dinner prep, but they also want to give away a box of goodies! 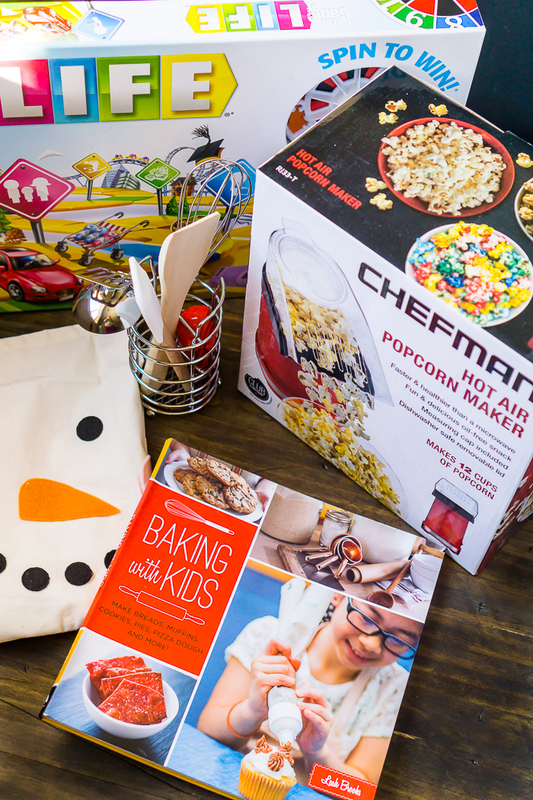 The prize will include a coupon valid for one free On-Cor entrée, children’s apron, kitchen tools set, children’s baking cookbook, The Game of Life, popcorn maker and popcorn bowl. To enter, leave a comment on this post telling me your goals for 2018 and which On-Cor entrée you want to try (or already love)? 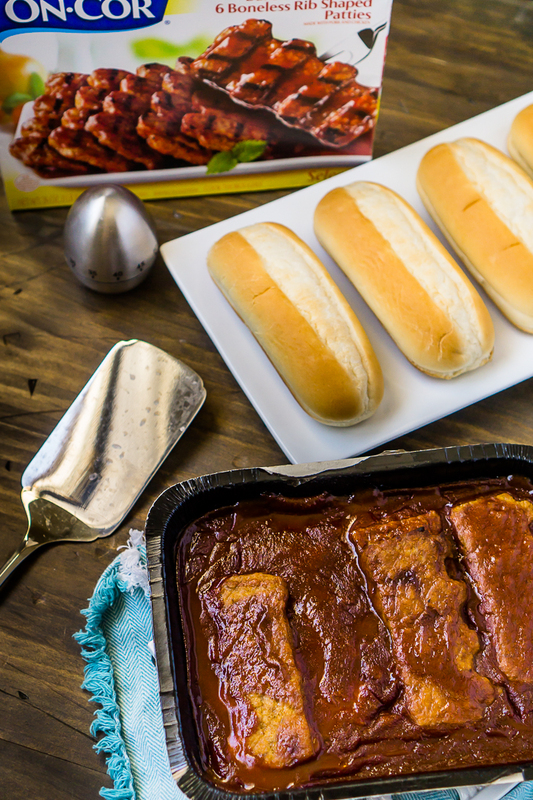 Now, Let’s Make This Tasty CopyCat McRib Recipe! Boneless Rib Patty Sandwiches are a quick dinner idea with less than 15 minutes of prep work. 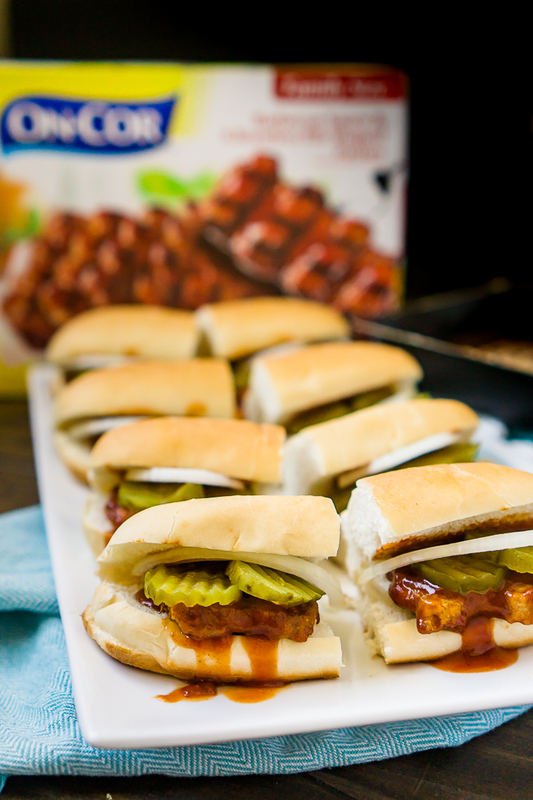 Inspired by the seasonal McRib Sandwich so you can enjoy a copycat McRib all year long! Cook Barbecue Sauce & 6 Boneless Rib-Shaped Patties in oven, following instructions on the box. When done, let sit for a couple minutes before assembling sandwiches. Place 1 Boneless Rib-Shaped Patties on each roll. Drizzle a spoonful of extra BBQ sauce on sandwich if desired. Then top with 4 pickle slices (more or less to preference) and a couple thin slices of onion. it’s funny, after moving out to the country I decided the best thing to do was to attempt to make my own McRib, which I have loved you since I was pregnant with my oldest son, over 30 years ago I decided the best thing to do was to attempt to make my own McRib, which I have loved you since I was pregnant with my oldest son, over 30 years ago! and this is my exact Recipe! And I vow to try the lasagna after all the rave reviews above! Thank you for the copycat McRib recipe. No more waiting & wondering when & if it will be available again. Looking forward to trying this! My goals for 2018 are to keep a consistent workout schedule and avoid work week burn out. I want to try the On-Cor boneless ribs! We like the Lasagna. One goal is to exercise more. I want to try the meatloaf slices. I resolve to read more to my toddler. We love the lasagna! I didnt realize that they had so many other products, i definately need to try them. My resolution this year is to live a healthier life and help my kids do the same. We love the On Cor Lasanga the most. AND our resolution for 2018 is more quality time together as a family. And these look amazing. I love the McRib.